The variety in Coconut Oil is extremely high, we often have no idea which type which brand Coconut Oil is good for your skin. The ingredient, the locations, the process is carefully chosen by us. We exclusively work with ingredients which are proven effective. Additional to that, our major goal is to give back to human and nature. Back to the Coconut Oil, there is a big variety in Coconut Oil. In the supermarket you will find coconut oil which can be used into your hair/skin and bake your veggies. Our focus is the skin and the hair, where the focus is the important of the process. But how can we recognize the right type of coconut oil ? Difficult, from the jar/bottle coconut all looks the same: white and they smell like coconut oil. But there is difference, which you can only investigate yourself. The same with Tamanu Oil, big variety in brands and type Tamanu Oil, but the quality is difference. Most of the coconut oil are refined, bleached and even deodorized..
We exclusive use the DME Method of coconut oil production. This is a form of "wet-milling" whereby the coconut oil is cold-pressed from the fresh meat of the coconut within 1 to 3 hours of opening the nut. DME method of coconut oil production delivers a pure, natural and totally unrefined pure Coconut Oil. This means that it is free from impurities and retains all the natural antioxidants inside coconuts. As we already wrote there are fundamental differences in Coconut Oil in today’s market. A large number of coconut oil is is offered for extreme lower prices and often the process is much easier and quicker to lower the production costs. The same issue is with Tamanu Oil, the variety in color and consistence is high. Therefore a lot of people among us see coconut oil as 'all the same' and 'only the price level is different'. Reality is different. As we already wrote there are fundamental differences in Coconut Oil in today’s market worldwide. A large number of coconut oil is made from copra, this is dried and processed coconut oil. Copra is dried over many days, often in not so hygienic conditions, shipped and stored for many weeks. The danger in this process is that moulds can grow on this raw material causing the oil to become rancid. The next step in this process is cleaning (refining and bleaching) this dirty oil by industrial/chemical processed, what will happen; this process destroy the natural substances of its coconut. The process often called RBB (refined, bleached, deodorized). Both high heat and chemicals are used in this method. That is why we exclusively choose DME process, and it gives us more than satisfaction to know that every purchase of a Volcanic Earth product directly assists Oceania island people in South Pacific to alleviate poverty. If you're not using coconut oil, or Tamanu Oil for your daily body care or common skin conditions, you're missing the benefits nature provide us. Coconut oil has a melting point of about 24-26 degrees and is therefore mostly solidified in our climate. Once the coconut oil touches your skin it will melt beautifully. You can use our oil as massage oil and combine it with Tamanu Oil for common skin conditions. Coconut Oil acts as an effective skin moisturizer and benefits all skin types. Even dry skin. 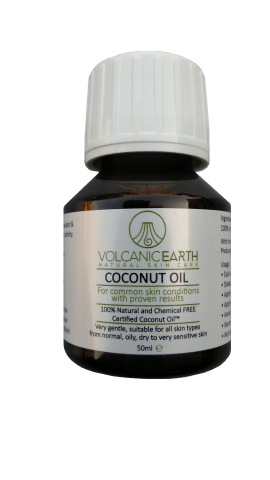 There is no chance of having any adverse side effects on the skin from using coconut oil. Therefore, it is a natural way for preventing dryness and flaking of skin. It also support delaying the appearance of wrinkles.